I read this quote to my students the other day at the end of a class. It’s one of my favourite quotes from a book that has been described as a “a brilliant tour de force” and that I yet have to read. Anyway, the past two weeks my practice has been erratic at best. And the last couple of days, I realised that perhaps I should listen to my own advice a bit better. Keep an eye on my objective, stay focussed, go around obstacles when they present themselves and just keep going, zigzagging, ducking, jumping, slowing down or picking up the pace when I need to. Just don’t give up. Note: Upon request, I have now linked the Sanskrit names of the asanas to a website where the poses and the sequence are all explained in great detail. Very valuable resource for those interested in the traditional way of Ashtanga. This reporting period starts with a slacking day on Sunday 6 November. On Monday I get my period. Two more days without Ashtanga and on Wednesday, I am at the tail end of my moon cycle, so I do a lovely long Yin session instead. It looks like I am going to be indolent again. I didn’t get up in time to practice before my class and am not proud of it. Only one student rocks up for my class, a practitioner with a pretty steady practice, though only in led classes. I have a light bulb moment and I propose to her that we practice together rather than doing a guided class. That way, she gets to feel what it’s like to practice without the Vinyasas counted out loud and other cues and we get to share the energy of our individual practice. A win-win, the way I see it! She agrees and we practice until Janu Sirsasana A, I set the pace as she follows me to get the sequence right. After the closing sequence we rest in Savasana and 90 minutes after our first Sun Salutation we get up and both feel the wonderful after-practice glow. Of course I ask for feedback and it turns out she really enjoyed the silent semi-guided practice. I think I may have sowed the seed for a little local Mysore practice group for in the near future. It has been a few weeks, but I am back on the mat for a Restorative Yoga class with one of my favourite local teachers. I do have the energy for an Ashtanga practice but a friend is joining me at Restorative and I have tonnes of other things to do. So I skip the Primary Series and dive head first into my busy day after the Restorative bliss and brunch with my friend. I don’t practice for three days. I am not sure what the obstacles are that I am not able to tackle. It is not a lack of energy because I am super active. In the weekend I am cooking, gardening, sorting through boxes with old memories, reading old letters, sending ex-boyfriends (the ones that I’m still on good terms with) copies of their own love letters and reminiscing about the years that I actually was as young as I still feel now. On Monday I have just two classes to teach and no other appointments. So it is also not lack of time. It really wouldn’t hurt anybody if I would take two hours for my practice. I think it is the loneliness. I simply don’t like practicing alone. I like to hear the breathing of fellow Ashtangis next to me, I like to feel the energy of their movement. Despite the eyes on me when I practice at home, it is still only just me. It is the largest supermoon since 1948 and the moon won’t be coming this close to earth again until 2034. If there was ever a day not to practice in my life time, it is today. I heard first hand (from one of my best friends practicing in Mysore at this very moment), that Saturday is not rest day anymore. Instead, at the main shala, Sharat – the grandson of Pattabhi Jois, founder of Ashtanga Vinyasa yoga as we know it today – teaches led classes on Saturday and Monday, leaving Wednesday through Friday for Mysore-style practice. So now Sunday is rest day. Lo and behold, we are deviating from the tradition! Is the universe going to self-destruct? No, the sun still rises in the East and sets in the West and all is well in Ashtanga land. I am teaching at 7.00 am so I really can’t be bothered to get up at 4 am to do my practice before going to the studio. Malesh! (Never mind in Arabic, vocabulary legacy from my time in Egypt). It’s a busy day. Stefano has not gone to work since Monday, recovering from a little surgical intervention that left him… well, let’s say, very tender. If you are curious about what I am cryptically babbling about, read this blog that I wrote last year and puzzle the answer together yourself. Anyway, I enjoy his company at home, even though I have lots of work to do. Lucky for me, he is not unwell enough to not be interested in food, so when I come home at 7.30 pm from my evening class, a beautiful dinner is served. Again only one student in my morning Ashtanga class, but not the same as last week. So I don’t hesitate and propose the same to her: practicing together instead of a led-class. She gets a taste of Mysore style while I get to practice too. Fortunately she loves it as well. My plan to cultivate Mysore style enthousiasts in the neighbourhood is steadily progressing. No excuses, slack slack slack. Saturday is not a rest day anymore right? I have a new idea. I google Ashtanga Primary Series on YouTube and select the first Full Primary that I come across recorded by a reputable teacher. You do find an endless number of bad yoga videos online but even if you do find a good led class on the internet, practicing with this is definitely not a technique that I would recommend to beginners. In my next blog I will explain why (click on Follow in the side column to make sure you don’t miss out on the next blog in which I will explain the pros and cons of practicing with a recorded class). However, for today’s purpose, I find John Scott’s Full Primary Series and I love it despite the fact that my leg is still not well. Trikonasana and Utthita Hasta Padangusthasana go as wobbly as expected and I have to be very careful in the Prasarita sequence. I struggle terribly in Bhuja Pidasana, Kurmasana and Supta Kurmasana. Upavistha Konasana A & B are impossible and the drop from Supta Konasana to the floor is out of control. But I breathe with John Scott through the entire series and Stefano is even back home in time from early morning fishing to lend me his ankles for a modified Urdhva Dhanurasana. Despite the fact that it is just a on computer screen, I have somebody breathing next to me, guiding me through the vinyasas and helping me to stay focussed. I do the full Primary Series for the first time again since Sunday 2 October. Best Ashtanga practice in a long time. On a Saturday, of all days! My little epiphany may prove to be a valuable one and I feel I may have found a way to keep the water flowing despite the rocks that are in the way. Diary of a Lazy Ashtangi – Week 7, 8 and some of the Yamas & Niyamas. No luck this first day of the Ashtanga week. Stefano has got a bad case of gastro and is in bed so I have to prepare the house for this afternoon’s pot luck all by myself. I am expecting a handful of local yoga teachers for lunch and though I don’t have to cook much because every body is bringing food, I still have a few things to take care of. I prepare a lemon-ginger-honey lemonade, clean the living room, prepare a quinoa asparagus salad and lay out the beautiful silverware that came in the boxes with my stuff from Holland. It reminds me of the times that I used to entertain people almost on a weekly basis, cooking five course dinners for friends, rolling 200 pieces of sushi or throwing a party for sixty souls. Oh well, it’s nothing that fancy today, but enough to not have time to practice! After teaching the Ashtanga class, it’s finally time for my own practice. I didn’t get up early enough to practice before the class but now the studio is nicely heated up, so I decide to practice here. Like last week, I stop after Utthita Hasta Padangusthasana, not wanting to over-exert my hamstring or whatever muscle it is that feels tender. I am surprised at how good I feel about not going all the way. Two years ago, I would probably not have considered doing less than a full practice, when I did get onto my mat that is. Five years ago, I would most likely have pushed it even a bit further, going deeper and stronger. Is it experience and wisdom that have taught me to listen to my body, to allow myself to rest when needed and to accept that being able to take it easy is just as valuable as knowing when to push through? Or is it simply old age that forces me to slow down? Either way, Ahimsa, non-violence, no harming, the first of the Yamas, the first limb of Ashtanga Yoga (the philosophy, not the asana practice) seems like a good one to keep in mind at this time of my life! Tuesdays are good for my routine. We are not fasting so I get up in time to make a juice for Stefano and as soon as he is out of the house and I have cleaned the juicer, I get on my mat. Again, I limit my practice in order to give my leg some healing space and take a beautiful long savasana. By restraining myself, I feel that I am giving and taking just what I need. Brahmacharya, the fourth of the Yamas, promotes moderation. And it works. I feel ready to conquer the world after this beautiful practice. Today I decide to do a Yin session and promise not to go easy on myself. The step from Yin to Restorative is easily made, but I stick to my intention. I do all my least favourite poses, such as Saddle and Frog and while I hold them, I practice surrender. Surrender to the pose, surrender to my body, surrender to the energy that surrounds me. The intensity of the poses become bearable thanks to this practice of Ishvara Pranidhana, the fifth Niyama which is about surrender to the higher power. Stefano and I had a little squabble yesterday and I am not in the mood. I know it’s going to be okay, it always is, but right now I choose not to practice, be grumpy and stay in bed until it’s time to get up for work. Satya, the second Yama, means truthful in feeling, thoughts and deed… Am I being truthful to myself? Am I saying the truth to Stefano? Why am I upset, really? After yesterday’s hiatus, I decide not to slack today, even though Stefano and I have not made up yet. He tried to, before leaving to work, but I was a typical obstinate Aries, Pitta, woman, whatever you want to call me. During the practice, I realise my leg is still bothering me in certain poses, so I go easy and stop after the standing sequence. I spend lots of time on Urdhva Danurasana though. As advised by Prem and Radha, the teachers I practice with in Bali, I use blocks against the wall to ease into the shoulder opening. I pay particular attention to my legwork, engaging them properly so that I don’t worsen the injury. I feel positive and energised. In the afternoon, I have an inspiring session with a group of entrepreneurial and creative women where we discuss our life’s objectives and areas that need refinement. I decide then and there that Stefano deserves my apology. At the end of his working day, I call him and ask if he wants to meet up for a beer. In the sun, enjoying a locally brewed beer, we kiss and make up. It’s a beautiful day. By now you should know that if I have an excuse not to practice, I use it. Official Ashtanga rest day today! By now you should know that if I have an excuse not to practice, I use it. Yes, again. But today is a big day. I am running a Yin Yoga workshop and I know that even if I would have managed to get up in time to squeeze in a practice before heading to the studio, I would not have been focussed. So I don’t even try. The workshop turns out a success and I so grateful that I have the opportunity to give and receive through yoga. For me, yoga is health of body and soul, a feeling of youthfulness and energy, a never ending and never boring journey of self-discovery. Santosha, the second Niyama which translates as gratitude, is what I feel and hope to practice more of in my life. Aaaah… that explains the low energy levels of the past couple of days! After teaching the 9.30 am class, I sit down on my mat and meditate a little. At noon, I have an appointment with the osteo, who confirms that it could be an adductor injury, although very light as it doesn’t hurt when I sit, walk, run or do any of the regular daily activities. It only bothers me when I actively swing my leg out to the side or bend towards my left leg while opening my chest to the side (not something an average person does on a daily basis, I admit). All I can do it be careful and mindful with my practice. The day after new moon. You can believe in it or not, but I feel like I have more energy than the days before. It could also be because I fasted yesterday. 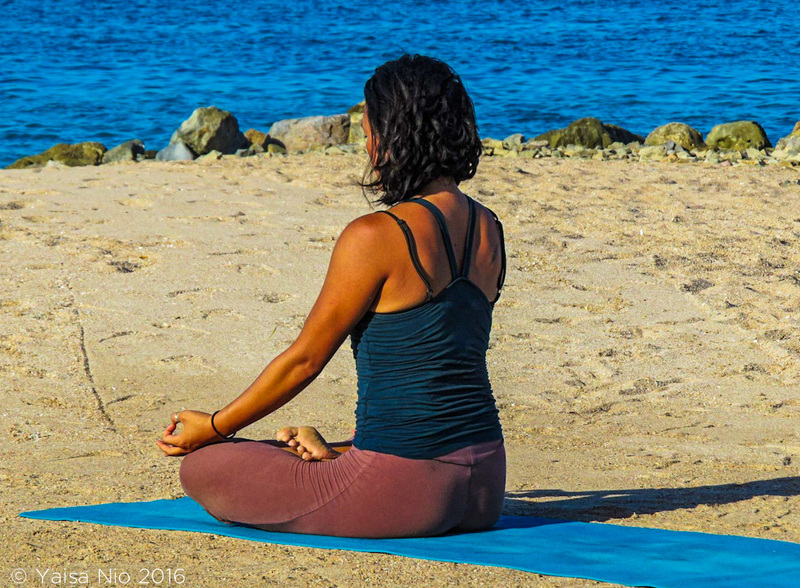 I decide to test my limits and extend my practice by including a few seated postures. When I reach Janu Sirsana B and try to sit on my right heel, it really hurts. I very inelegantly palpate the tender area and finally pinpoint the exact source of the pain. I almost get sad and frustrated about it all. Just recovered from a shoulder injury and now this lingering issue for weeks. But I need to let go of my greed, of my attachment to the practice as far it will harm me. Yes, there are others out there that have progressed in their practice much faster than I have. Yes, there are people out there that do poses that I might never reach. Yes, it’s one step forward, two steps back sometimes. But thou shall not covet thy neighbour’s asana: Aparigraha, the fifth Yama, is all about non-attachment. Today I choose Yin. I breathe through long held asanas, trying to release tension from the back of my legs and lower back in 10-minute Squat, a very gentle Dragonfly pose, a deep Butterfly and reclined spinal twists. I don’t know where the time goes, but before I know it, it’s time to go for the restorative massage that I booked. Yin and massage. Not a bad way to start the day! Today is fasting day again so I am not up at the crack of dawn to make our juice before Stefano goes to work. Nonetheless, I get up early enough to practice before my 9.30 am class. Since I am not doing the entire Primary, I only need an hour or so for the Surya Namaskaras, Standing and Closing. I am pleased to notice that in Urdhva Dhanurasana, my shoulders are feeling open and strong. I have come a long way since the injury that led to a frozen shoulder. I am grateful for the practice as it has greatly helped me recover my health in that department. Now fingers crossed for the leg! Tuesdays and Fridays are my no excuse days. I am up early to make a juice, I have no early morning class to teach and these are the mornings-after-fasting, so plenty of energy. Now that the temperatures are getting warmer, it’s all much less of an issue for me to get started in the mornings. I have a great little practice. True, much of the yoga practice is a question of inner discipline. That is Tapas, the third Niyama. But my Tapas, my drive, my inner fire, certainly burns a lot better at 30 degrees Celsius than at 20. Summer can not come early enough as far as I’m concerned. An Ashtanga-free day, but yoga-filled nonetheless. Teaching two Vinyasa classes and then off to a friend’s garage sale of which the proceeds will go to her sweet dog that needs an expensive brace to walk. Karma yoga, right? I spend the rest of the afternoon pottering around the garden. What a feel-good day!